If you have never been to Russia, what do you think the weather is like in the country? You might instantly think that it’s cold there all year long. Well, that is not entirely true given the country has four seasons in a year. But, Russia does have an extreme kind of weather. It can be very cold during winter, warm to hot in the summer, and quite wet during spring and fall. Winter could be very long and the temperature may drop below -35C⁰ with the coldest in Oimjakon region with -50C⁰ in January. Each of the seasons doesn’t get the same amount of time slot because winter alone could take almost six months in a year. It is during winter a very special festival happens for two weeks from the December 25 until the first week of January. The event always begins on the December 25 with the closing somewhere around January 5 to 9. This festival, though, is only celebrated in Moscow. The whole city would turn into a winter wonderland and offer amazing experiences you can’t get anywhere else in the world. The winter festival in Moscow celebrates three events in a row; Christmas, New Year, and Svyatki – the Orthodox Christmas feast. Looking at this fact, you can imagine how grand this annual festival is. All kinds of activities, entertainments, and festivities are spread all over the city to indulge both Russians and visitors. Let us now see how Russian celebrates Winter Festival in Moscow. This so-called festive village can be found in Revolution Square, Moscow during the Winter Festival. Here, locals would open stalls in the provided market to sell traditional crafts, souvenirs, food, drink, clothing, accessories, and also this special handmade traditional Russian winter shoes named Valenki. The whole square would be lit, merry, and colorful. If you are much into music and performance, then you should visit Izmailovo Park. It is situated in the North-East of the city. You can reach this place using Moscow Metro and hop off at the Izmailovskaya Station that borders the northern side of the park. The dance and traditional music concerts will take you to the older atmosphere of Russia. Still in the Izmailovo Park, you can also experience winter sport like skating and sledging. The most interesting thing you can find in the park, especially if you are a tourist – please don’t miss it, is the troika ride. It is a sleigh pulled by three beautiful horses. You will be snuggled inside the sleigh under a blanket while being taken on a ride around the park. Cold weather surely makes the tummy run empty quickly and the body crave for something warm to feel better. The most common food and drink you can find around the Moscow during Winter Festival are authentic vodka and snacks like bagel and pancake. But when you visit traditional market during this time of the year, make sure you try the local dishes too. Borscht, Solyanka, and Okroshka are the soupy dishes you can try to warm yourself up. For the heavier meals, try Beef Stroganoff, Salted Herring or Kholodets. On the side, Kotlini and Blini pancakes will be nice. Other winter sports you can try out other than skating and sledging are skiing and hockey. Both of the latter you can find on the Gorky Park. Cross-county skiing is situational depends on how much the snow fall. This park can easily be found if you take the metro and hop off at Park Kultury Metro station because it’s right across the station. Still in Gorky Park, you can also find ice sculptures all over the place that cover the figures of cathedrals, animals, giant valenki, and a huge ruble coin. What famous during winter in Russia are also Father Frost and Snow Maiden, named Ded Moroz and Snegurochka in Russian. Ded Moroz is similar to Santa Claus of the western culture. He brings presents and gifts for well-mannered children and usually wears a blue-and-red long robe, carrying a tall cane. If Santa Claus is accompanied by Black Peter, Ded Moroz has his granddaughter as a helper. This girl is the Snow Maiden or Snegurochka. She would wear a silver or white long dress and hood. These two Russian winter icons can be found in the festival as people who wear costumes and act as them or as statues placed everywhere in the parks and shopping malls. They are definitely what the children are looking forward to meeting during Christmas and New Year in Moscow. These two festivities are common during Winter Festival especially on New Year’s Eve. They may sound just like any other new year celebration everywhere in the world. 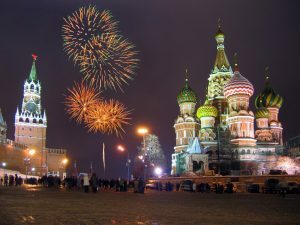 But when it lights Moscow’s skyline with its landmarks, the fireworks in Russia become very special. People say it looks like pictures from postcards because of how beautiful it seems. The feast can also be experienced when Svyatki takes place in January. This event is huge but also brings a lot of controversy around its history. But if you don’t mind, you can always join the Orthodox Russian and celebrate their version of Christmas. Those are the things you can find and experience during winter in Russia. Those are how Russian celebrate Winter Festival in Moscow. It is such a high and important time of the year for the country especially people in Moscow, the center of the festivities. Make sure to travel there somewhere in December to January if you want to feel the richness of their winter culture. It is going to be one of the most unforgettable things you can have in your lifetime.